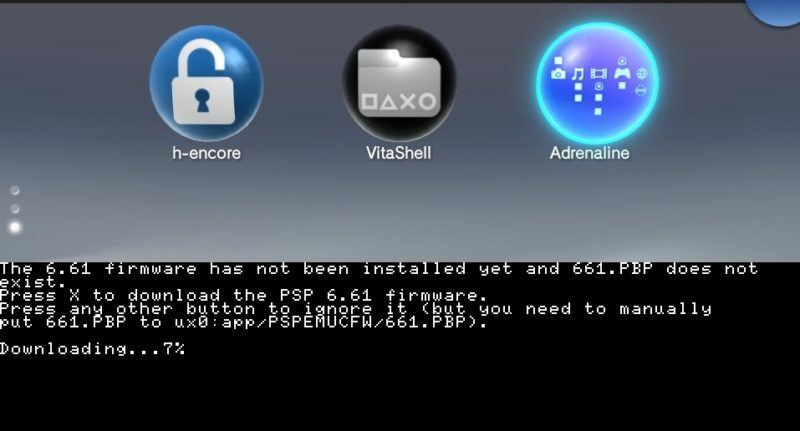 Adrenaline mimics the official Sony PSP emulator on the Vita, it will boot up as if you are playing the PSP on 6.61 custom firmware. This tutorial will show you how to install Adrenaline through VitaShell, make Adrenaline download a hacked PSP firmware so you can use it to play your backups, fix a known bug on Adrenaline, and where to put your PSP and PS1 backups. PSP iso and or PS1 eboot. Step 1: Enable View Hidden Folders. You need to enable View Hidden folders to see everything in your memory card. 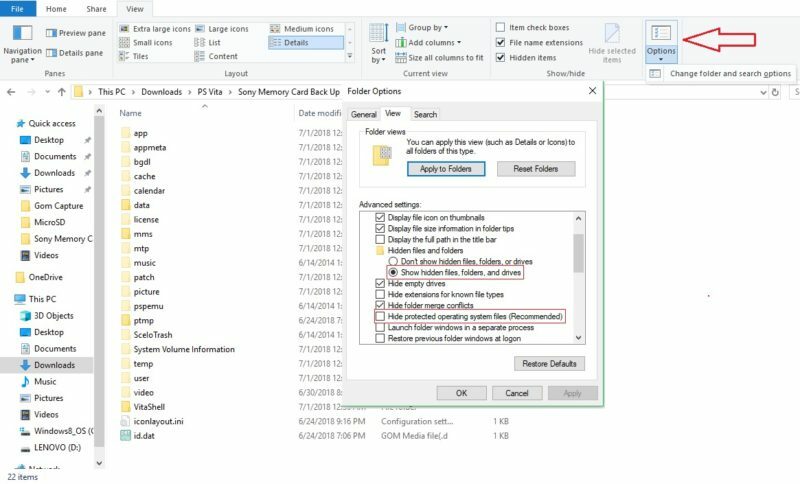 Go to View / Options /Change folder and search options / View / and select “Show hidden files, folders, and drives“, and make sure to uncheck “Hide protected operating system files (Recommended). Click Ok. For Mac Users, you can use CMD + SHIFT + . to enable hidden folders and again to turn off the view. Step 2: Launch Vitashell and Connect via USB. Launch Vitashell, press Start and change “SELECT button” to USB. Press O to cancel main settings and then press select to connect your Vita to your PC. If you are using SD2Vita, change the USB device to SD2Vita. Step 3: Move the Adrenaline.vpk File to the Vita. Go to the folder where you stored the download Adrenaline file and move it to the App folder that just popped up when you connected through the USB. This step can also be done through FTP servers. Step 4: Use VitaShell to Install Adrenaline. Press O to cancel the USB connection and go to ux0:app folder and Press X on the Adrenaline.vpk file and X to confirm the install. You can delete the Adrenaline.vpk file after the installation if you need space. Step 5: Go Back to the Home Page and Launch Adrenaline. Go to the home page and turn on your WiFi, this will allow Adrenaline to download the PSP firmware. Then click on the Adrenaline bubble and launch it. You will get a message that says “Press X to download the PSP 6.61 firmware” so press X to download. IF you accidentally push any other button besides X, Adrenaline won’t download and you will need to delete Adrenaline and install it again to get it to download. Step 6: Launch Adrenaline Again. Launch Adrenaline and this time it will say “Press X to install the PSP 6.61….” so press X and let it install. Once it is done “Press X to boot the PSP XMB.” You will then be launch into the PSP interface, set up your PSP and enjoy! Step 7: Fix Adrenaline Double Launch Bug. Adrenaline has a bug that requires users to press Adrenaline twice to get it to launch. Go to your tai folder (if you are using Sd2Vita your tai folder should be in ur0:tai) and press X on config.txt. 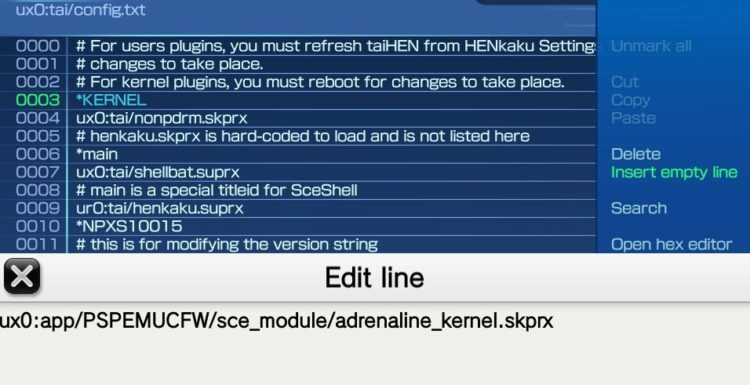 Go down to *KERNEL and press “Insert empty line” and type in “ux0:app/PSPEMUCFW/sce_module/adrenaline_kernel.skprx” without the quotes (this will always be ux0 no matter which memory you are using). Press O to get out of the text field and press O again to get a prompt to save your modifications, press X to save. Bonus: Where to put Your PSP Backups. Exit out of Adrenaline (Hold the PlayStation button then click on settings next to Adrenaline, Exit PspEmu Application). Go to VitaShell and connect through USB again. For the folder that just popped up, go to pspemu folder and create an ISO folder in there. Transfer your PSP ISO here. Go back into Adrenaline and go to Game/Memory Stick to play your PSP backups. If you ever had a PSP, you know you can also put other emulators. 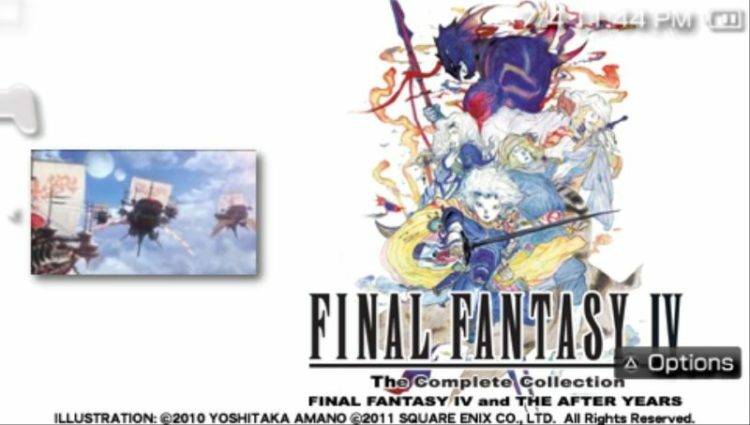 However, the PSP and PSX are going to offer the best emulation. Bonus2: Where to put Your PS1 Files. Go to VitaShell and connect through USB again. For the folder that just popped up, go to pspemu/psp/game (if these folders are not available, create them). In order for Adrenaline to recognize your PS1 Eboot (format of the rom) you need to put the Eboot inside a folder. 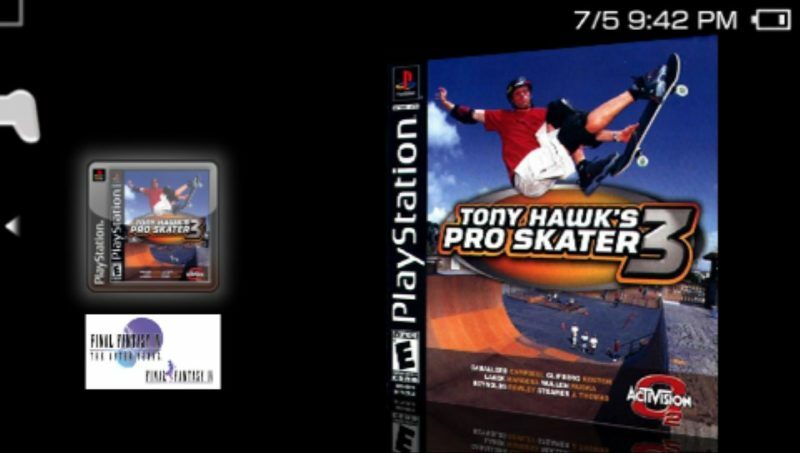 In this guide, I have an Eboot of Tony Hawk 3 and I put it inside a folder called GT3E52 (but it can be called anything). Go back into Adrenaline and go to Game/Memory Stick. I just installed H-Encore on my vita, which is on 3.68. All seemed to work fine, but then I tried to install Adrenaline and it does not work at all. It asks for extended permissions, but there is no possibility to check “Enable unsafe homebrew”. The only options available are Theme, USB device, Select button, disable auto-update, restart vita shell and the likes of power, reboot, power off and standby. Do you have a solution? Your help is much needed and appreciated. It sounds like you need to run H-Encore again. Since you are on 3.68 you have to run H-Encore every time you shut off your Vita. Dude, you’re a lifesaver! Thanks a lot!!! I’m just glad it worked for you. Thank you for using my guide! Yes for each emulator, you have to put the roms into a different folder. I believe for SNES roms you need to put it in ux0/data/SNES9x. I just finished setting the sd2vita, maybe i forgot to set up more stuff on it? Are you sure you transferred everything from your old memory card to sd2vita, make sure to enable hidden folders when you transfer everything over. I don’t think there is a tekken 8, sounds like a fake but the fact that you can play anything shows that you are putting it in the correct place. therefore in the step of download PSP 6.61 is unable to go through. I wonder if there is any way I could download it with a computer and move to somewhere required and continue with the setup? Look for the 661.PBP, and I think you will have to start from Step 5. Look at the picture to see where to put that file. You are fortunately as I was hacking my psp and manage to find these files. Let me know if that works! Is it normal that with Adrenaline, the PSP XBM menu doesn’t looks clear as an original PSP but has like a compressed, low resolution appearance ? I haven’t look at the two side by side, but it doesn’t look too crisp on Adrenaline. I will when it is available. As of right now, you can’t hack the vita on 3.70 but should be able to sometime in late 2019. Did you meant to say you are on 3.68 firmware? Since you manually downloaded the 6.61 firmware did you put that file in ux0:app/PSPEMUCFW? Very nice tutorial, everything worked right away, I’m excited. Thanks for the great instructions! Thank you, I’m glad it worked out perfectly for you! How can I stop the emulator? If you hold the home button a menu will pop up allowing you to exit.